1. Insert ingredients in bread machine according to manufacturer's instruction s. Remove the dough from the machine after the first knead - approximately 20 to 30 minutes. 2. Place dough on a floured surface. Divide into 5 parts. Form balls, gently press thumb through center of ball and slowly stretch into bagel shape. 3. 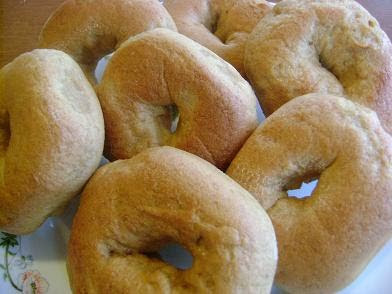 While bagels rise, bring three quarts of water and one tablespoon of sugar to a rapid boil in a large saucepan. Drop test dough (see hints below). 4. Using a slotted spoon, drop 2-3 bagels into rapidly boiling water. Boil on each side for 1/2 minutes. Remove and cool on rack 1 minute, brush with egg and sprinkle with sesame or poppy seeds, if desired. 5. Bake at 400 on a baking sheet sprinkled with cornmeal, until golden - approximately 15 minutes. ** When forming the bagels, set aside two 1/4" balls of dough. When the bagels have doubled in size, drop the test dough into boiling water. The dough should pop to the top right away. When this happens, it is time to boil the bagels. ** A quick spray of non-stick vegetable coating on the top of the bagel may be substituted for the egg wash.
** To make bagel sticks, cut bagel before rising and lay out in a straight line . Roll sticks in a combination of sesame and poppy seeds with a pinch of garlic powder. Let sticks rise, boil, and bake as described in the above direction s.
** To make bagel chips, slice leftover bagels horizontally into thin slices. Brush with butter or margarine on one side. Lay (butter side up) on an ungreased cookie sheet and bake at 325 for 12-15 minutes until golden brown and crisp.